Making great 3D renderings and film is not just about making things look real, it’s about making people feel real. Real estate marketing CGIs or renderings are finally starting to catch up with the narrative and idea-driven approach so ubiquitous in other industries. The reason for this lag in embracing the world of storytelling is the relative youth of the 3D rendering industry. In its first decade the industry was obsessed with developing tools and methods for replicating or simulating the unbuilt: “Does it look like a photo? !” was the clarion call of CGI artists and clients the world over. Each new plugin, texture pack or script that allowed an artist to make the texture of the sisal rug more real, the leather of the Winchester couch more weathered or allow light to penetrate the surface of a marble statue – would be met with, "Can you tell it's not REAL?!". What’s next in real estate CGI? CGI has long moved past the hyper-realism that leaves the viewer questioning whether they are looking at a render or a photo. The question that now faces the Australian project marketing industry is whether we will continue to play it safe or embrace the bold new future and be the global leaders in leading the charge. So, what is the next stage in real estate CGI? At Binyan, we feel that narrative and concept-driven images and films – that inspire, intrigue, or make you laugh – are the future and present of our industry. Human beings communicate through storytelling, but are those words laboriously describing the product – or are they taking the viewer on an immersive rollercoaster of sight, style and sound? Paragon of Pyrmont: "Dare to Live Here"
One of my favourite recent examples of a project that tells a story is Paragon Pyrmont, which we created in collaboration with Luke Berry & Thirdi Group. Having a boutique, high-end product and a client willing to challenge convention allowed us to develop bold and an “I dare you to be me” personality for the imagery. With a client who was willing to challenge convention and a high-end, boutique product we were able to develop a bold personality for the imagery. And what does the lucky inhabitant of this “make your friends jealous” landmark have in his living room? A Masserati of course! Starting with a concept based on a mysterious Gotham City look – and a brand association with Masserati and Rolex – we created a hero exterior that is stylised and projects character. Not giving too much away – its other-worldly tone dares the viewer to look deeper. 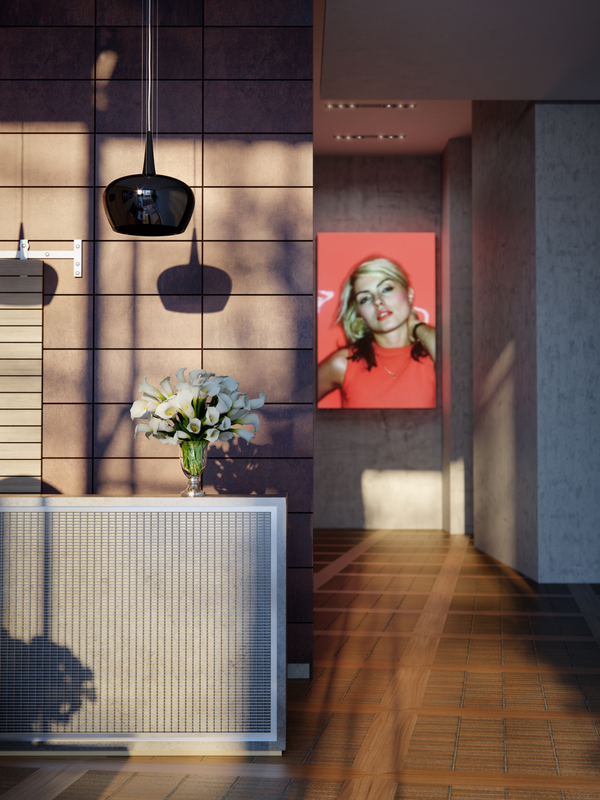 The story creates an instant brand and cache for the project – both Domain and Realestate.com.au did unsponsored feature stories on the development because of the "clickability" of the renders. Thirdi Group were approached by numerous property industry websites and magazines and Channel 7 did a news story "Live like a superhero" on the project. Director of Thirdi Group Luke Berry couldn’t believe how successful our images and animation were in driving enquiry and interest in our campaign's story. 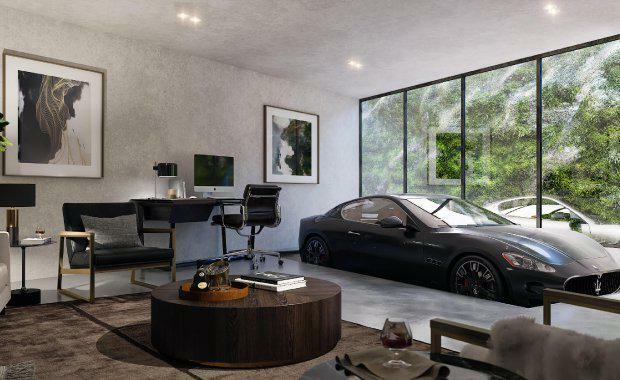 "From a marketing point of view, the conceptual 'Maserati Man Cave’ renders and animation have been our most successful marketing strategy yet." In the US the idea of storytelling in renderings is not new -- clients, agents and creative agencies challenge their 3D Rendering collaborators to come up with an “angle” on the campaign – to push the project in a clear narrative direction. "I think there is always a story behind a thoughtful building design. That story shapes a building's personality and gives it an identity in the market. A well-executed rendering pays attention to the nuances of lighting, placement of objects, visual angles and other creative variables to tell the building's story to the market." –Developer behind Exhibit, in New York's financial district, Scott L Aaron. What is unique about this project is that the story began in the architecture, interior design and styling itself. Rather than being super-imposed at the end, the narrative was totally integrated into the project character. The project is called Exhibit because its walls are a rotating photography exhibit of the iconic downtown Manhattan celebrity photos from the '70s and '80s taken by artists such as Marc Weiss, Allen Tannenbaum and David Godlis. 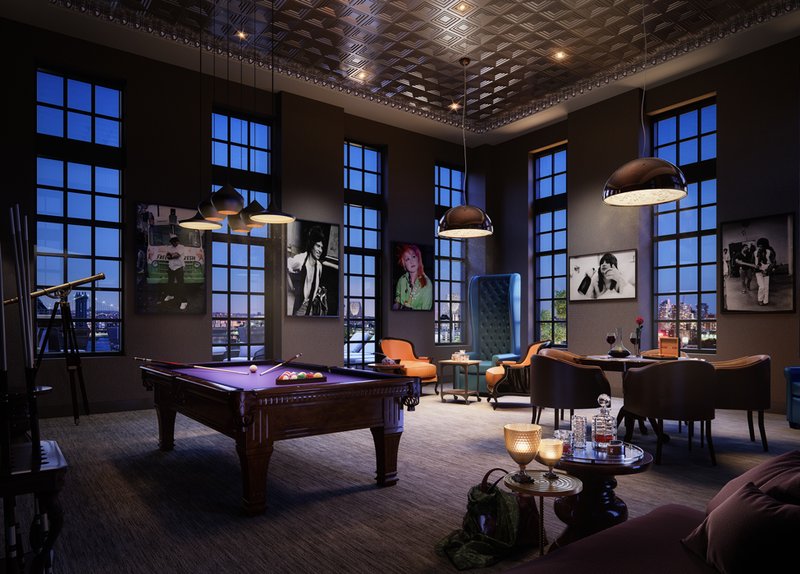 The high-end rental development will feature over 100 vintage photographs rotating among the floors, including cult heroes such as the Ramones, Madonna and Basquiat. For his latest project Waterfall he decided to build the seven-story Waterfall – as you do. The challenge in CGI was how to make this a signature feature – we wanted to create the feeling of being immersed in the falling water. The final project – hot off the press – is Charlie Parker by Coronation. Inspired by the address and musical references the client brought in renowned artist Gillie & Marc to design a series of sculptures to appear in the development. Our team 3D-scanned the real statues and inserted them as 3D models into the scenes. We wanted to viewer to smile, and look for the hidden surprises – the launch was a wild success and the project has a memorable visual language. "As the Australian market is more accustomed to buying off-the-plan and the Sydney market in particular shifts, it is critical to stand out in the crowded world of CGIs. For example, with Charlie Parker we wanted to inspire a new way of living and still ensure the representation of the elegant architecture is 100% accurate and not misleading. We achieved this with Binyan by incorporating the art of the talented Gillie & Marc. 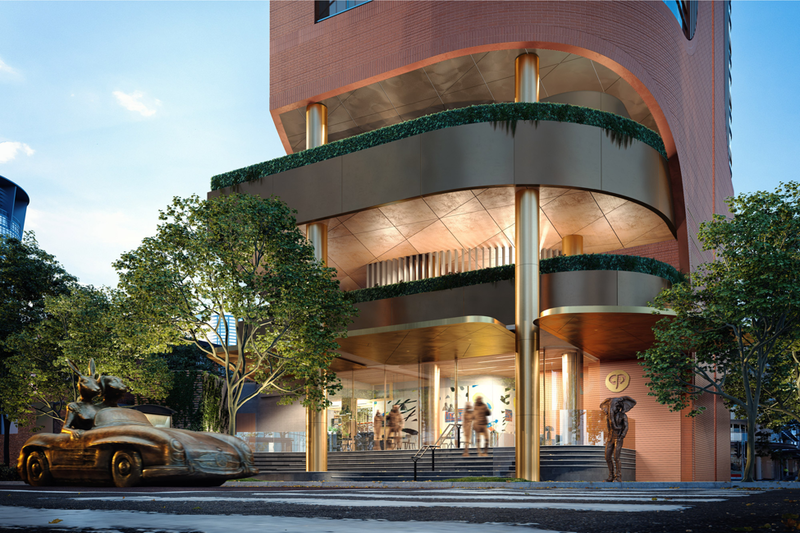 It inspires imagination, has a sense of playfulness, respects the stunning design of the building, embraces the culturally rich landscape of Sydney; and of course, makes you stop and take a closer look!” – Kirsty Bradley, Coronation Property Co. So, what is the common thread in all the above projects? They all seamlessly blend renderings and brand to tell their story to their audience -- playing it safe and trying to be all things to all people will get you a “same-same” result. Investing in developing a concept and idea makes the campaign smart, edgy and one that everyone will be talking about. 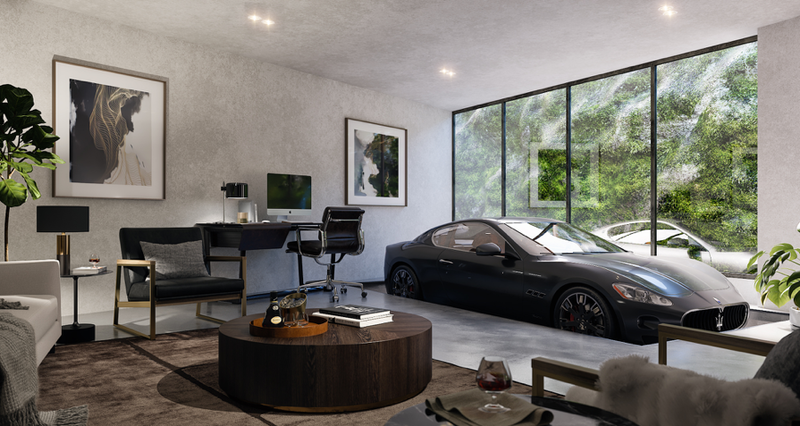 This is the new direction in CGIs and 3D renderings – where ideas, smarts and cut-through reign supreme and the 3D artists push the emotive power of their craft to pull at the heart strings of the client of your desires. 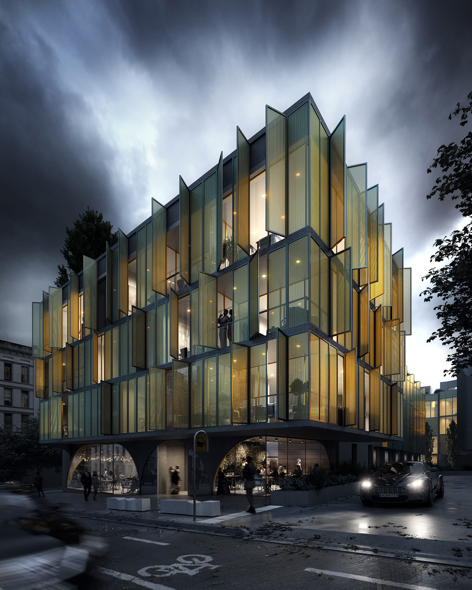 Andrei is an interior architect and visualisation industry leader specialising in the creation of bespoke, considered and memorable architectural images and films. He founded Binyan Studios in his Sydney living room after working as a visualiser in the U.S. and has since guided Binyan to be one of the world’s leading architectural 3D rendering and animation houses, with studios in Sydney, Melbourne, Brisbane and New York City. 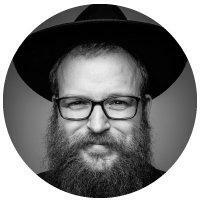 He frequently speaks at international conferences such as the Autodesk University in Las Vegas in November. The Urban Developer is proud to partner with Binyan Studios to deliver this article to you. In doing so, we can continue to publish our free daily news, information, insights and opinion to you, our valued readers.